I'm been on a roll again. I still had a few strips left over from my Nancy Crow class in October. I liked the colors a lot and thought they would look good against a gray background. I pulled out several of my gray fabrics to give them a test run (and forgot to take a picture to show you!). But in the end, I picked a slightly tan shade of the gray. 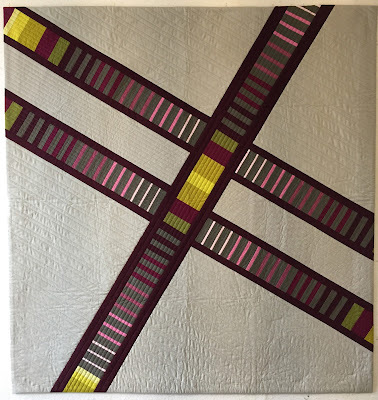 This is one of the quilts that I quickly drew up a couple of weeks ago while watching TV. I wanted to make a square quilt this time and give the strips an edging of color. I fell in love with the dark maroon/purple fabric and thought it gave the strips sets a nice pop against the background. I decided that I really wanted the thread to match the top of this quilt and of course, I didn't have the right colors. So, I ordered more thread. I think I now have thread lust to go along with my fabric lust. So here it is all quilted and faced. I like the placement of your colors. . .it is as if the strips glow! I also liked how you framed your strips! You are sure on a roll!